The m option displays all data in MBs. The total os 7976 MB is the total amount of RAM installed on the system, that is 8GB. 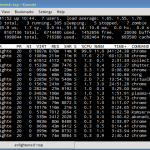 The used column shows the amount of RAM that has been used by linux, in this case around 6.4 GB. The output is pretty self explanatory. The catch over here is the cached and buffers column. The second line tells that 4.6 GB is free. This is the free memory in first line added with the buffers and cached amount of memory. Check the values of MemTotal, MemFree, Buffers, Cached, SwapTotal, SwapFree. They indicate same values of memory usage as the free command. The top few lines indicate total memory, free memory etc and so on. Check the KiB Mem and KiB Swap lines on the header. They indicate total, used and free amounts of the memory. The buffer and cache information is present here too, like the free command. 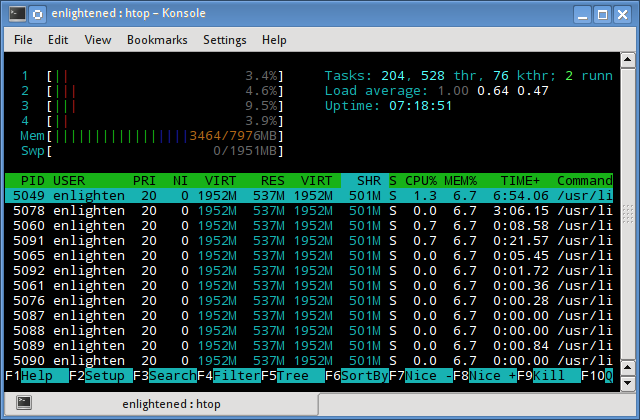 Similar to the top command, the htop command also shows memory usage along with various other details. The header on top shows cpu usage along with RAM and swap usage with the corresponding figures. To find out hardware information about the installed RAM, use the demidecode command. It reports lots of information about the installed RAM memory. Provided information includes the size (2048MB), type (DDR2) , speed(667 Mhz) etc. ksysguard on KDE. Both provide resource usage information about cpu, ram, swap and network bandwidth in a graphical and easy to understand visual output. I have a question, how to use ram access for each person? Is there any way to monitor memory usage in real time. Something like a script which checks the memory usage and sending the report to a particular email id in a given interval of time. Indeed, it is a good reference for memory related commands. Thank for sharing. I have a question. How to get ram usage for each process? Your command here is very useful. what is the resolve process for jmx alerts like( live thread alerts)? Debian server was inaccessible after some days , no ssh etc. and the error was no resources are available. Through console server is not accepting any command, Then I need to hard reset the server, what could be the issue ? We are running voip application on this server. My server memory indicator is on and the error is “Uncorrectable Error detected for “Memory Device 14” on subsystem “System Memory””. Is there any way to fix it instead of rebooting the server? Since this is a non-destructive operation and dirty objects are not freeable, the user should run ‘sync’ first. Option 2: Free dentries and inodes info. Option 3: Free the whole lot – pagecache, dentries and inodes. I have a UNIX box. In that totally 8 servers running.. Any one tell me how to chk the memory info of those servers..
hello siva you can use a single different different terminal on the screen then login to that terminal using your user id and run the command top , netstat , free -m , on that terminal gnome , hope at a particular time you can able to check memory status . As you might be aware that we can open multiple terminal at a time on Linux and can run command on that terminal hope this would help u out…. 17 mean the type o DMI that you want to analyse, in this case “Memory Device”,. How can I only get the free – buffers/cache numbers from free -m command?. I tell awk to grab the 4th column with “print $4” because the awk command will default to a blank space as the delimiter between columns. If you need to you can specific the column delimiter as well. Very helpful! But I’d love more clarity on the gap between 2048 MB in the DIMM according to the last one (I’ll assume you actually have 4 of them, which properly totals 8192 MiB? ), and the 8167848 kiB number in top, meminfo, , vmstat, and the 7976 MiB(?) number in free, htop, etc. I note that the dmesg command provides some more info to bridge that gap, e.g. on my system: [ 0.000000] Memory: 16096680K/16465712K available (7630K kernel code, 1131K rwdata, 3616K rodata, 1352K init, 1300K bss, 369032K reserved) vs top output of KiB Mem: 16126600. Please correct the typo in “RAM Information” section. The command for viewing hardware info about RAM is “dmidecode” and not “demidecode”. And it also requires root privileges. seriously…. the last command was just awesome…. never seen anything like that.. .